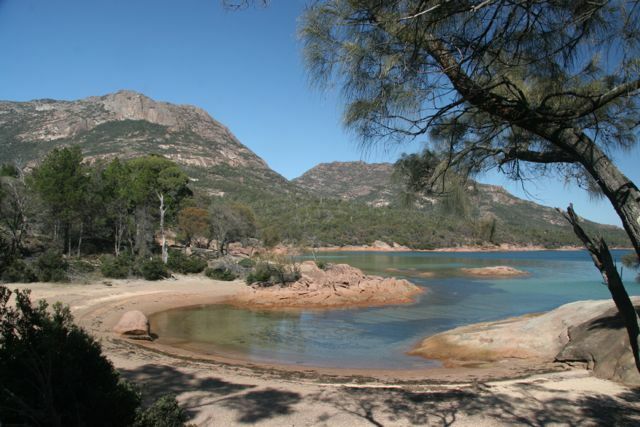 Stayed for two nights at Seven Mile Beach caravan park – a bit disappointing as it’s located right in the middle of a suburb and quite a way from the beach. 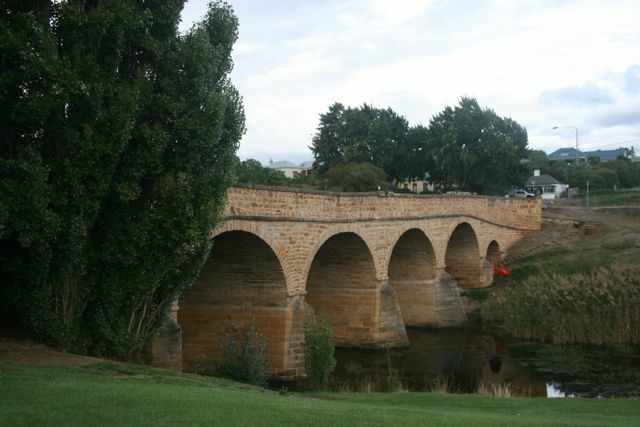 One highlight was taking a shuttle bus to Salamanca market. The bus visited several caravan parks, collecting passengers and took us up to a lookout, where we could see a great view of the Tasman Bridge, Constitution Dock, the Derwent River and all of Hobart’s characteristic, old buildings, built in the 1800s. Spent a couple of hours roaming through all the stalls at the market and brought some crumbed fish for lunch, before getting on the bus and heading for home. 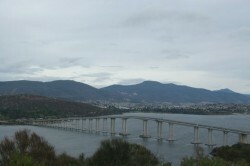 Next day we headed for Freychinet National Park, travelling though Richmond, where we crossed the oldest bridge in Australia, built by convicts in 1825. The unevenness of the bridge is due to settlement, caused by flood and drought. 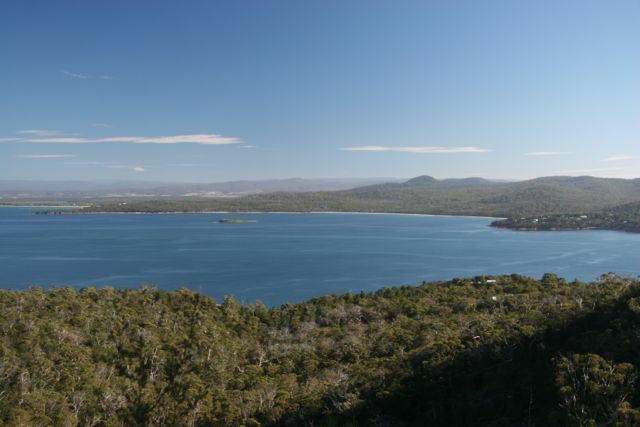 We were in a shocking storm on the way to the national park, but when we arrived, a couple of hours later, we were greeted by sun and the most incredible camping site, right on Great Oyster Bay. 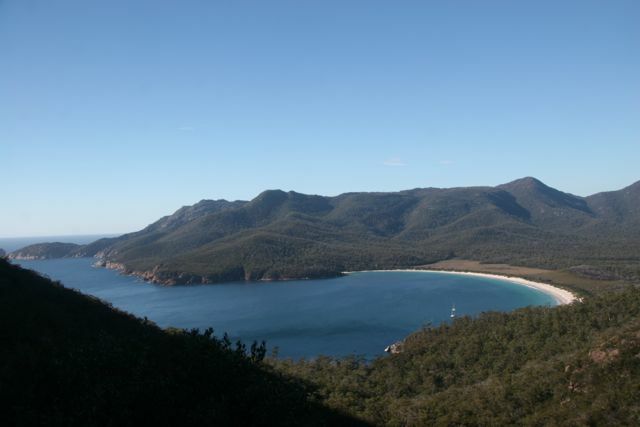 There is power and water here, with large eucalypts, sheeoaks and bush to the sea. We have extended our stay to four nights. 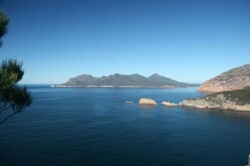 Yesterday we drove to Cape Tourville and walked around the Cape, giving us the most spectacular views I have ever seen in my life. Unfortunately, our photo of this scene doesn’t do it justice. It’s amazing what our eyes can take in, that the camera can’t capture. We then picnicked at Honeymoon Bay. This entire park is an absolute gem. I can’t remember any other place that is so breathtaking. Today Russ went on a 1 hour walk to Wineglass Bay Lookout. 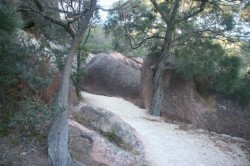 The walk was fantastic, excellent gravel track that climbs continually with lots of stone steps along the way. 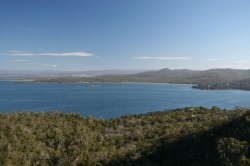 Views over Coles Bay appear from time to time as you climb up. 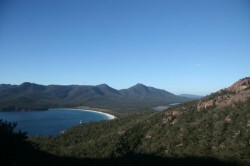 To the south of you, as you climb, is the massive rocky bulk of The Hazards Range, again adding to the beauty of the walk. The range was named after Captain Hazard, a whaling captain who hit a rock in Wineglass Bay. The bush surrounding the track was delightful, ancient Sheeoaks, gnarled old gums and lots of different bushes filling in the gaps. Massive boulders lying around as if placed by a landscape artist, added to the impression that you were in a botanic garden. 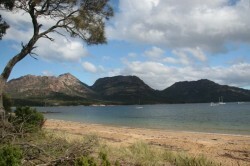 The view of Wineglass bay was well worth the effort. It is not known why it was named Wineglass Bay, may because of its shape, or maybe because it was stained wine red from whales blood from whales killed at the whaling station, that used to exist at the south end of the bay. 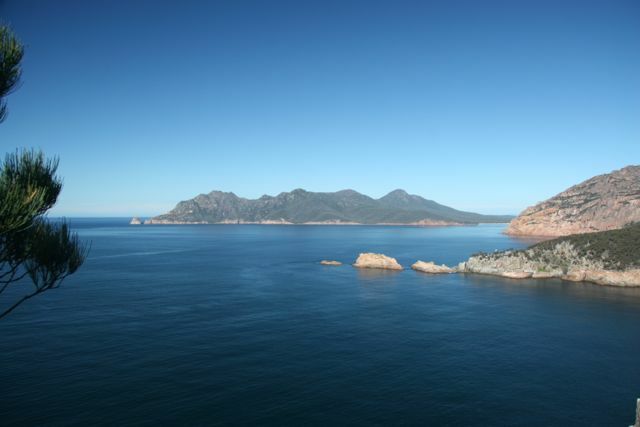 If you plan to travel to Tasmania, make sure you don’t miss Freycinet National Park.